Dnsmasq is an incredible piece of software, an integrated DHCP, DNS, PXE and TFTP server. It's extremely lightweight and easy on CPU and uses very low memory, perfect for constrained embedded systems. Using dnsmasq significantly improves web browsing experience, much better than the browser's inbuilt DNS cache. However there are better DNS servers around, why dnsmasq ? As said earlier in this article, it's not just a caching DNS server, it's lightweight and easier to configure. I'm using dnsmasq as TFTP and PXE server too. Dnsmasq is available as pre-compiled binary package for almost every Linux distro, for Debian and it's derivatives like Ubuntu, Linux Mint, install dnsmasq with the following apt command. For Archlinux and it's derevatives like Manjaro, Chakra Linux use this command. Create a new group dnsmasq , will be used later in the dnsmasq configuration file. Let's edit the dnsmasq configuration file to use it as caching dns server, there is one main configuration file /etc/dnsmasq.conf , and it could also load many individual configuration files from the /etc/dnsmasq.d/ directory. First backup the original dnsmasq.conf file to avoid to fix the configuration mess up, if there's any. Then start editing the main configuration with your favorite text editor like nano, Gedit etc. Note: Editing the configuration file requires root privilege. Look at the dnsmasq example configuration I'm using in a Debian testing system. You may directly copy-paste and save the above configuration, now I'm explaining a little what these configuration options mean. listen-address , use this IP as DNS server IP. port , bind this port to the above IP, 53 is the default DNS port. bind-interfaces , it forces dnsmasq to really bind only the interfaces it is listening on. user and group, dnsmasq daemon's user and group. pid-file , path to the PID of dnsmasq. no-poll , don't poll /etc/resolv.conf for changes. bogus-priv, bogus private reverse lookups. cache-size , max limit of cache size in memory. resolv-file , DNS resolver file used by dnsmasq to resolve from internet. addn-hosts , use a additional host file, very useful. Note: It's also possible to run dnsmasq as root user and group, but experts suggests not to do so. The addn-hosts option is interesting, you could use a long list of domains pointing to localhot(127.0.0.1) to block malicious web advertisement. Now create the /etc/resolv.personal file, which is used by dnsmasq to resolve unknown DNS requests from another upstream DNS server. And put some nameserver there like bellow. I'm using OpenNIC DNS servers above, they don't keep any log and updated very fast. Finally restart dnsmasq so new configuration could be loaded, restarting dnsmasq could be different for different linux distros, first try with the service command on Debian based systems. If it fails anyway, try again with systemctl command. As systemd is now the default init daemon on most linux distributions, including Archlinux and derivatives. Now the dnsmasq caching dns server is running and listening for DNS quarries on port 53. Configure your connection manager like Network Manager , Connman or Wicd to use 127.0.0.1 as DNS server. This step may be different, depend upon whic connection manager you are using. 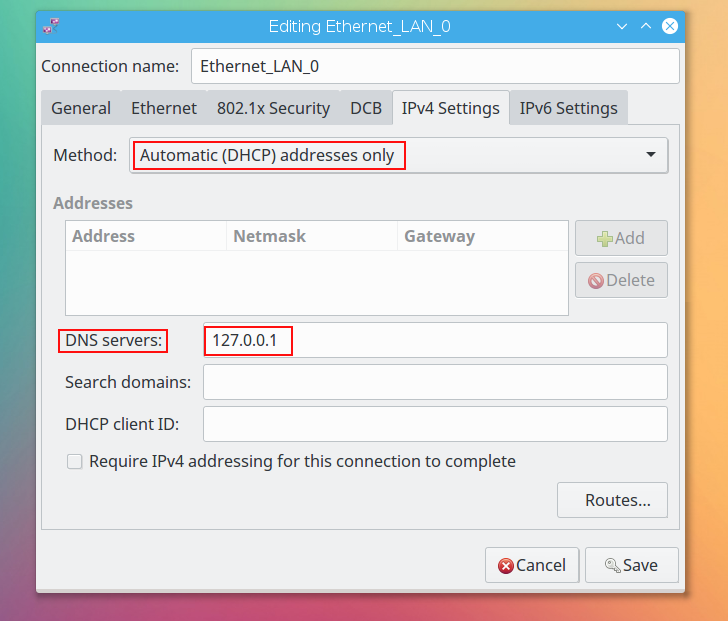 For Network manager, edit your connection and set Method: to Automatic (DHCP) address only and set DNS servers: to 127.0.0.1 , exaple screenshot bellow. Ubuntu, Linux mint or other Ubuntu based Linux distro may be already using another name server information handler like resolvconf , surely it will conflict with dnsmasq. So if you are planning to use dnsmasq on ubuntu as caching dns server, better to stop resolvconf first, have a look on commands bellow. su -c "echo 'nameserver 127.0.0.1' > /etc/resolv.conf"
First it may take some time, about 0.5-2 seconds, now run it again, the reply will be instant, just few miliseconds. Flush dnsmasq DNS cache: If you ever need to flush DNS cache, just restart dnsmasq server and all cache will be flushed from memory. Dnsmasq is extensively found on OpenWrt, dd-wrt and other router firmwares, one of the most important software there. It's also used by Network Manager as DHCP server to share internet connections. Dnsmasq DNS server also minimizes the risk of dns leak. Know more about the basics of dnsmasq in this wiki article. So that's it, how to configure dnsmasq dns server with caching support in a Linux system for super fast DNS lookup and more. If you have any suggestion or question just leave a comment, also don't forget to share your thought on dnsmasq here. Do you have any suggestion/hint for memory usage per cached dns address ? Lets say If i set the cache size to 500,000 how much memory is assumed to be used. Truly I've no idea. It would be fun to do a little experiment to find that out. Thanks for this clear explanation ! Can u please more explain the addn-hosts option ? i am into using dnsmasq to block ads on http request . I was running other docker containers which was using the UDP default port. But dnsmasq was already running so docker containers were failing. The "port" flag really saved my day. There was no flag "port" in the default dnsmasq.conf file and adding this flag made it work on a different port.